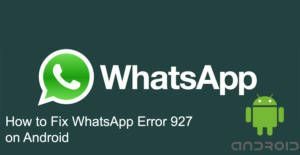 Are you getting Error 927 while you are installing or updating WhatsApp? This is not a problem because of an application. This is generally related with Play Store and your accounts on your device. We will give you some tips on this page for your to fix this on Android devices. If you have any other similar error code, you can check our list via clicking here. We will also provide solutions for many other errors for you at incoming pages. Let us tell you how to fix this error on your phone. See: How to Delete Whatsapp History Permanently? At the first stage, you will need to clear all accounts from your phone. You can do that on the account settings. Please make sure that you have removed all your accounts and then restart your phone or tablet. After the restart, you will need to clear cache and data of the Play Store application. Now you are ready to install WhatsApp messenger from Google Play Store once more. Now you can use the WhatsApp again. Please ask us if you have any question with the comment section at the bottom of this page. We recommend you to check if there is any available Android OS update for your device. If there is any available update, please do it. It will help you a lot with fixing problems with your device. If you couldn’t fix your problems yet, then give a try hard reset to your device. However we recommend you to take a backup of your pictures and important files on your phone before doing that.